As of yesterday I reached the point of viability, AKA v-day! Legally, that means doctors would do everything they could to save him if he were born now. Statistically, that means baby would have between a 40-70% chance of survival if he were born now, so obviously we want to keep him in there for much longer! But by 26 weeks that chance goes up to about 80-90%. Full term isn’t considered to be until at least 37 weeks – the point where baby would most likely have no lingering health problems. And 39-40 weeks is considered optimal. So yeah, keep baking little boy! Mama is feeling pretty good this week. Aside from some pesky sciatic pain and a little bit of hip pain, that is. I’ve also had a tiny bit of heartburn, but nothing like the fire breathing dragon I felt like last week. All in all, a pretty good week, physically-speaking. Belly is continuing to get bigger and bigger… while my belly button is getting shallower and shallower. I’m up 1.6 lbs. this week for a total weight gain now of 12.2 lbs. I’m kind of bummed I’m not getting the luscious pregnancy hair other women often get. I read that many women stop shedding hair while pregnant, which results in thick and healthy looking hair. I’m definitely still shedding hair, and my hair looks more dull and frizzy, if anything. I also feel like I’m totally missing out on that whole pregnancy glow. My skin is both dry and breakout prone at the same time. Funny how all the old wives’ tales say that girls steal your beauty but I feel like my little boy is! Maybe that means he’ll be one handsome dude? According to old wives’ tales, with girls you carry all over and with boys you’re all belly out front, but I definitely feel like I’m getting wider. I’ve resisted looking at a rear view of myself, but I have a feeling I am NOT the type of person who only looks pregnant from the front. I pretty much have no waist definition anymore! 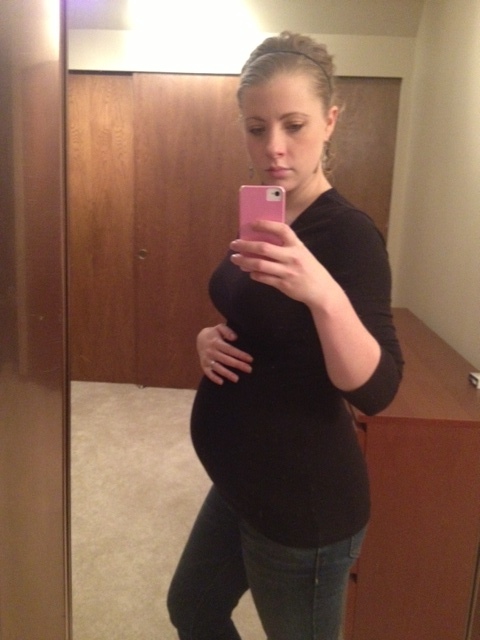 Oh well… 16 more weeks and mama can start getting her body back! I’m right there with you, about loving the kicking! Especially when a “bump” goes from one side clear over to the other side.